'Aeolius' (Marky Smith, R. 2009). Seedling #04-20D. IB, 22" (56 cm), Midseason bloom. 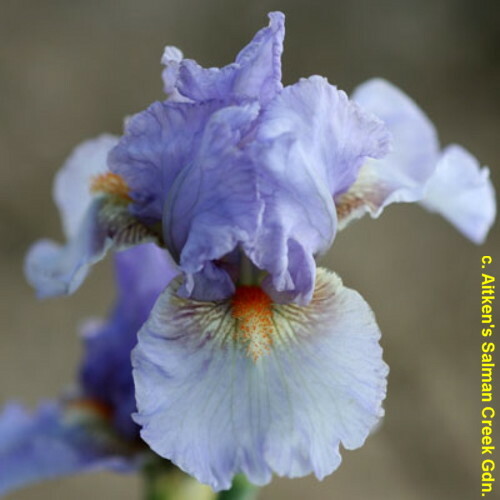 Standards and style arms greyed blue-lilac (RHS 92A); falls darker blue-lilac (92B) at shoulders, below brown lines surrounding beards, paling greyer toward distal end; beards strong vermilion in throat, vermilion in middle, hairs tangerine tipped white at end; ruffled; pronounced sweet fragrance. 'Ripple Effect' X 'Seafire'. Aitken's Salmon Creek 2012.